Carved by Shivkumar Sharma, Brijbushan Kabra and Hariprasad Chaurasia’s starred hands. Rhyming through time as we travel down harmonic routes to our core. Here the heart and soul unify as can be heard in this music. As The Mountain path allows spirit to ascend and attain heaven’s door. With a means to pass over all of the ills we’d forget. Decorate with fresh vigour the calls for the soul love defends. Here then are the disciples of faith, making their way to the mountain. The call of the valley sings to them. Let us in listening now, comprehend. Cast by resonance, the steam rising from the river of strings heard before. As night descends and the mountain is shifting its shape through Santoor. A curative cast by music to rectify each day’s pain. Song of the Forest – Jhinjoti dhun clatters in with growing light across branches. 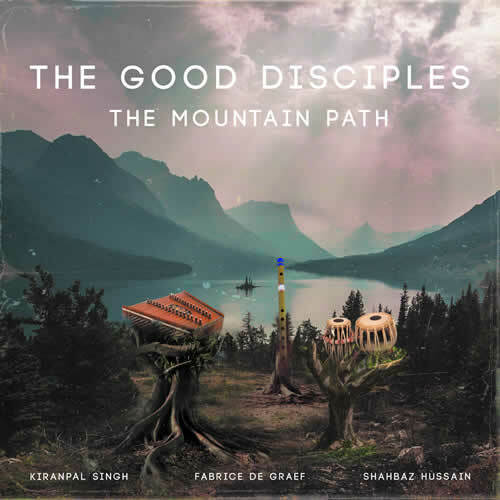 Of the mountain that these Good Disciples experience as they pass. The clouds open up, as prised breasts of fruit admit flavour. Renewal overwhelms us. With heart breath sparked, each bird laughs. Exultation – tabla Rhythms (Sitarkhani) sound holds the energy of this moment. As it soul journeys on, charged and primed for endeavour. The rippling path is an echo to the movements and speed traced in love. Harmonic Reflections – Kirwani Alaap essays glissando. Kiranpal Singh picking nimbly through a flutter of notes, the true way. Meditations, reflections on the task at hand and time’s claim. And scar. The path troubles here as the travelling causing trouble. As we ride it become and wear its stone flesh. Gat (Teentaal) finds repose. Greater ardour as the disciples encounter death’s fatal force on the trail. You feel the triumph and sheer primacy of their dare. To dream and desire winning the way, passing tests. And translating across flute and tabla, the stylings of a past all should prize. We picture the golden birds swirling, depicted in a dance across sky. Than the organ within, our own heart. Sets. Where do we find the mountain? But the path is within us. And all of the hopes and dreams we expect.